The CZ 75 B Stainless is the first stainless steel firearm to bear the CZ name. With the exception of an ambidextrous manual safety and rubber grips, the stainless version is functionally identical to the CZ 75 B. The only difference is an improvement in corrosion resistance, though many will argue that there is an improvement in appearance as well. 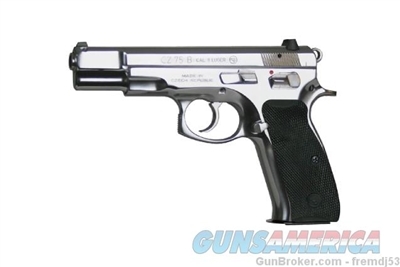 CZ 75 B is used by more governments, militaries, police and security agencies than any other pistol in the world. The CZ 75 is quite possibly the perfect pistol. All steel construction. High capacity double column magazines. Hammer forged barrels. Ergonomic grip and controls. Unparalleled accuracy. Slide-in-frame design for better recoil control. 3 dot sighting system. Smooth double action and crisp single action. Extended service life due to advanced design and superior materials. Firing pin block safety.